IMBIMBO, Modestino V. "Vinny"- Formerly of Boston's North End died peacefully in his sleep on February 5th at 90 years of age. He was born March 4, 1928 to Carmela (DeVingo) and Modestino Imbimbo. Vinny also lived in Dorchester and Nashua, NH. He currently resided at the Chelsea Soldiers Home for the last 5 years where he made many new friends, as he was cared for, loved and was respected by the whole staff and visitors. He was a WW2 veteran who served in the Army Air Force and was stationed in the Philippine Islands. He was a retired Boston Police Officer, who joined in January 1951 and retired in 1993. He is survived by his loving sisters Pauline Iacozza and Sabina Masucci. He was the loving uncle to Vincent Masucci and his wife Karen, Anthony Masucci and his nieces Maria Masucci and Camille Imbimbo. He was adored by his great nieces and nephew, Vanessa, Angela and Joseph III. 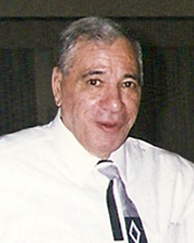 He was preceded in death by his brothers, Ernest and Victor Imbimbo, his best friend and brother-in-law Joseph Masucci, brother-in-law Willie Iacozza and his nephews Joseph Iacozza and Joseph Masucci, Jr. He enjoyed trips to the White Mountains and Salem, MA. His hobbies included watching old movies, playing cards and completing the daily newpapers Jumble and Cryptoquote puzzles. Vinny enjoyed storytelling, he often vividly quoted lines from old horror films such as Frankenstein, Dracula and the Wolfman. He will fondly be remembered for making people laugh and for his great sense of humor. We will all miss you because "You are beautiful" Family and friends are kindly invited to attend a Funeral Mass celebrated in St. Michael the Archangel Chapel on the Campus of the Chelsea Soldiers Home, 91 Crest Avenue, Chelsea on Saturday, February 9th at 12 Noon. Visiting Hours will be held at the Chapel prior to the Mass from 10 AM-12 Noon. Private Burial Services will be held on Monday, February 11th at St. Michael's Cemetery, Boston.